Our company is owned by Max Miller and has been in business since 1959. We pride ourselves in having more than 30 years of combined experience. We have been recognized by nationally published magazines for many of our auto upholstery jobs and commit ourselves to complete customer satisfaction. Contact us at 321-254-5336 to discuss your next upholstery project today! There really is no more dramatic an accent or impressive a feature you can bring to the interior of your car or the furniture in your home or office, than the richness and elegance of fine upholstery. 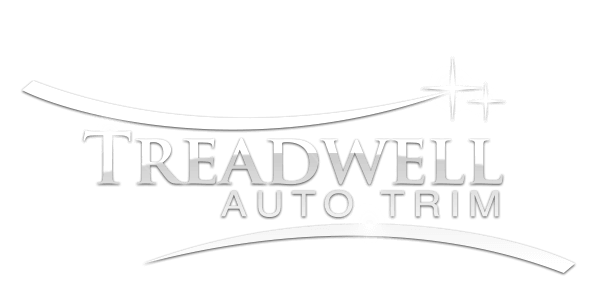 Treadwell Auto Trim has been bringing the finest in quality craftsmanship to our automobile and furniture upholstery clients in and around Melbourne, FL since 1959. We offer you world-class expertise, for any level of upholstery work you need, in any application. From automobile upholstery, carpet, convertible tops and car headliners, to commercial and residential furniture, we bring only the highest level of quality to every piece we work on. Whenever you need upholstery or auto interior work done, you of course want the end result to look as good as an original piece, if not significantly better. We take great pride in every piece of upholstery we work on and it shows in the end result of our work. But don't take our word for it! Take a few minutes to look at our Gallery of photos to see the work we have done over the years and those more recently. 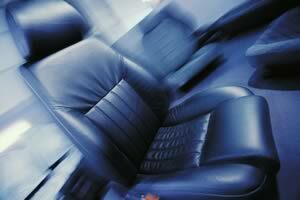 When it comes automobile upholstery, the quality of our work is next to none. In fact, a number of our classic car and custom automobile upholstery jobs have actually been featured in leading automobile magazines. We work in many types of fabric including leather products and standard OEM fabrics, but we now also specialize in exotic hides. Our exotic upholstery options now include: Hornback Gator skins for multiple applications, in several colors and sizes; Ostrich skins available in a variety of colors and sizes; real Stingray skins as well as; Shark skins, Elephant hides, Snake skins, Fish skins and Lizard skins. These are all real, 100% animal skins - we never use imitation skins. Other than our standard leather, OEM quality fabric and exotic skins, Treadwell Auto Trim is also an authorized Katzkin™ dealer and auto interior installer. 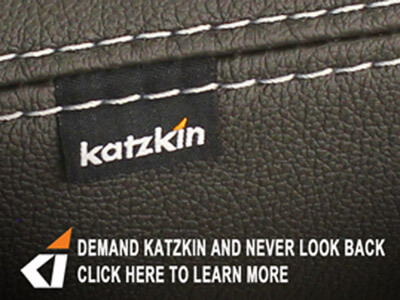 Katzkin™ is widely recognized as one of the premier manufacturers and suppliers of factory quality upholstery for all makes and models of automobile upholstery anywhere in the world. 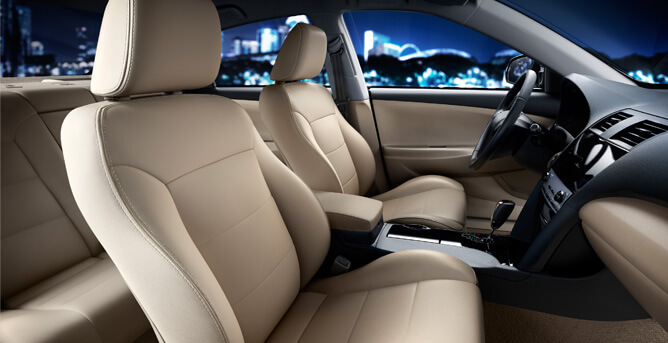 When it comes to installing factory replacement automobile upholstery in your automobile, we are very proud to be a authorized Katzkin™dealer and installation facility. The Florida waterfront lifestyle brings it own set of challenges to the upholstery of cars in a number of ways. The harsh sun can be very damaging to leather and this can show itself in the upholstery of your car in just a few years time. Once the sun actually damages your upholstery, it is very hard to repair or undo. Cracks can develop and that familiar pealing and feathering look can appear. Aside from that, most of us don't even think about things like suntan lotion, sunblock or other lotions. The damage lotions do to leather can eventually be just as bad as sun damage, but we often don't notice the damage until it is simply too late. Over time, suntan lotion and other lotions, even if you wipe them off the top of your seats, will eventually work their way into and underneath the leather through small holes. The lotion accumulates under the leather, but stays moist the whole time, eventually rotting the leather. Because this is happening from underneath, you usually won't even notice it happening until it rots all the way through to the top, forcing you to replace your seats. When either of these things happen to the upholstery of your car, it is the perfect job for Katzkin™ factory replacement upholstery. We can match up the replacement upholstery by the year, make and model of your car and then match the colors perfectly to the factory specifications for your upholstery. This then is essentially factory replacement upholstery, so your car will be returned to you with a showroom quality look! A lot of our finest work has been on classic car restorations and custom car projects. We know how to bring the original quality, look and feel back to your classic car restoration project. Whether you are restoring a classic car for personal enjoyment, plan to show it, or are looking at it as an investment and will be taking it to auction, we have the craftsmen that can give you the flawless quality you need for your upholstery job. You know very well that even the slightest of details are vitally important when it comes to a classic car restoration. The paint jobs often cost thousands and thousands of dollars, the motor and body work thousands more and the interior and upholstery work must meet just as exacting a standard. Our craftsmen are extremely talented and knowledgable in exactly what you need to meet the exacting and critical eye of show judges and buyers. From the selection of each piece of leather, to the cut and fit, to each and every stitch we put in, we will make sure you get an absolutely flawless upholstery job that is next to none. We strive to make sure that each and every job we do will be of award winning quality and one you can be extremely proud of. We are also very proud that some of Treadwell Auto Trim's more impressive upholstery work has been featured in such high-profile and popular automotive publications as High Beams Magazine, Mini World Magazine, Street Trucks Magazine, Hot Rod Magazine and numerous others. We can work with you to deliver any type of custom upholstery job you can envision, in any sort of design and in any range of colors. When you need the absolute best custom upholstery work for you custom car project, we can deliver an award-winning, magazine quality upholstery job for your project! As we mentioned earlier, Treadwell Auto Trim offers complete and full-service residential and commercial upholstery repair and replacement for your home of office furniture's upholstery. When it comes to your home furniture we can repair or replace any of your seat paddings, completely re-upholster your couches or love seats, and even repair or re-upholster your patio furniture. When it comes to your commercial and office furniture we can repair or replace any of your restaurant or cafe' seating in leather or cloth and of course take care of any and all of your office furniture upholstery needs. Please don't hesitate to contact Treadwell Auto Trim today, to discuss any of your automotive, residential or commercial upholstery needs!